Meatloaf Stuffed Shells is made with large pasta shells, leftover meatloaf, and a few other ingredients for a fabulous recipe. This is a fabulous way to use up leftovers. If you want to make this recipe and don't have leftover meatloaf, just cook a pound of ground beef along with the onion and garlic. Drain it well and use it in the recipe. This one dish meal is hearty and filling. All you need to serve with it is a green salad or a fruit salad, and some iced tea or sparkling water. ﻿Cook pasta shells as directed on package. Drain and set aside. Preheat the oven to 375 degrees F. Spray a 13" x 9" glass baking dish with cooking spray. In large saucepan, cook onion and garlic in olive oil until tender, about 5 minutes. Stir in meatloaf, 2 cups of the pasta sauce, and Italian seasoning; bring to a simmer. Place 1/2 cup of the pasta sauce in the bottom of prepared casserole. Stuff the shells with the meatloaf mixture. 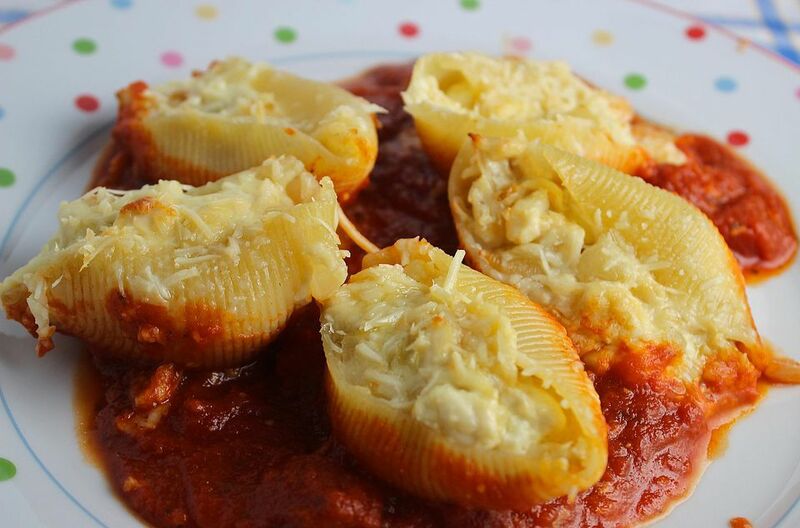 Place the shells, stuffed side up, on top. Spoon the rest of the pasta sauce over all. At this point, you can cover and refrigerate the casserole up to 48 hours. Or bake it immediately. To eat right away, top with remaining mozzarella and Parmesan cheese and bake for 25-35 minutes until casserole is bubbling and cheese browns. To bake from the refrigerator, top with the cheeses and bake for 40-50 minutes until bubbly and browned.